Gayle and I started the H.A.L.O. Foundation 24 years ago, shortly after three-year-old Sarah lost her abilities following a health crisis. All around us the news was bleak: bombs in the World Trade Center, the Savings and Loan bailout, Somalia, Bosnia, Waco and flood devastation along the Mississippi River. H.A.L.O. was a way to effect change with our small sphere of chaos: the lives of children with severe neurological impairment. Today we continue to work with individuals, families and compassionate nursing homes, schools and other organizations for the comfort and fulfillment of our target population. Brain damage still cannot be reversed, but new technologies such as the eye-tracking device in this issue, are being developed to enhance the capabilities of affected individuals. I am grateful to all who have joined us in this effort. during a sensory motor group at NEPC. Inspired by a love of gardening, Michelle Pelletier facilitated a therapeutic gardening activity for students at the New England Pediatric day school this year. 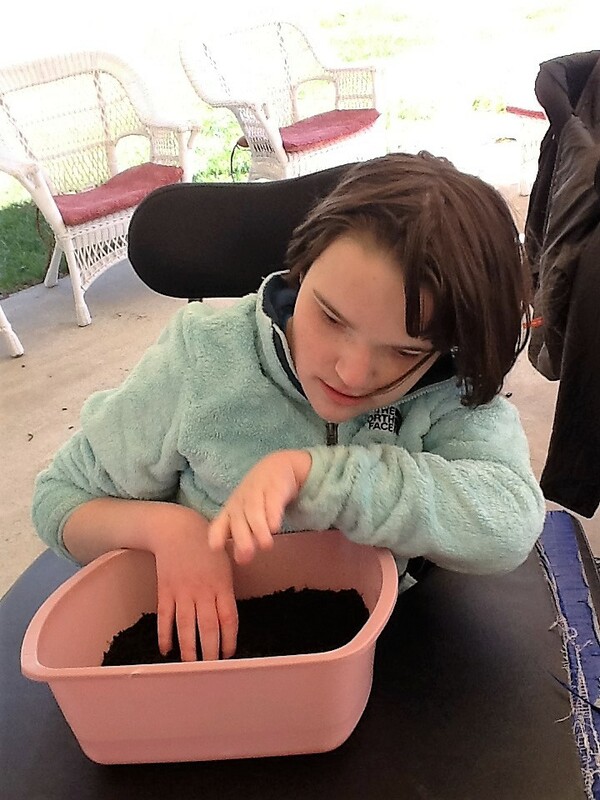 “Planting and cultivating fruits, vegetables and flowers provides excellent sensory motor exploration,” explained Michelle, a certified occupational therapy assistant at NEPC. Gardening exposes the children to tactile and olfactory stimuli that they don’t experience every day. It also provides a valuable social opportunity and focal point for interacting with family members and caregivers. Collaboration was central in creating the low-budget garden. Michelle’s dad donated the seeds and soil. The maintenance department at NEPC scavenged parts from expired wheelchairs and other equipment to build the raised beds so the kids (who are non-ambulatory) could access the plants at wheelchair height. The nursing staff determines whether temperature, humidity or pollen could impact a child’s condition on any given day, and if they can’t go outside staff members always volunteer to water. NEPC Director of Education Amy Gagnon, M.Ed., points out that the garden contributes to parity for the challenged learners, who are educated apart from mainstream students due to their fragile medical conditions. “It’s important that our students have similar access to typical, age appropriate activities,” she said. 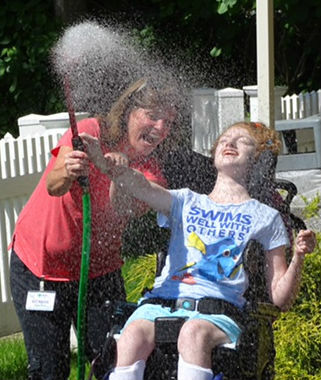 NEPC is an 80-bed skilled nursing facility for children in North Billerica, MA. Visit NEPC.org for more information. 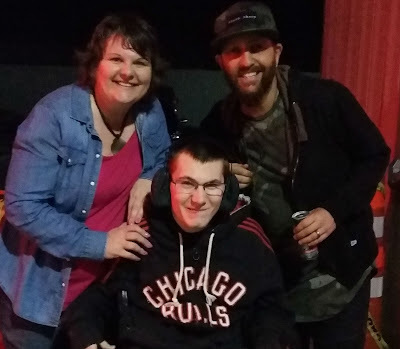 Ethan and his mom meet Preston Brust from LoCash, his favorite country band. Ethan B. of La Moille, IL has loved the water since he was young. Swimming is on par with his passion for the Chicago Bulls, and going to live concerts with his mom. Born with cerebral palsy-mixed quadriplegia, swimming is an excellent physical activity and great social participation for the 18-year-old. It provides a therapy environment that doesn’t stress the joints, promotes good health and social development skills and builds his self-esteem, according to Mary Anne, his mother. Ethan’s grandmother very generously funded installation of an above ground pool last summer. The family is very close, so Ethan’s cousins regularly enjoy swimming with him. Ethan has grown to 128 pounds and it became dangerous for Mary Anne, his primary caregiver, to transfer him from his power wheelchair into the pool and out. “It wasn’t safe for him or for me,” said Mary Anne. The Spa Lift Ultra chair was identified as the best option but insurance would not pay because the chair is not considered a medical necessity. Mary Anne organized a fundraiser and successfully applied for a grant from Challenged America, and raised more than half of the $3,678 cost. H.A.L.O. paid the remainder. The lift was scheduled to be installed mid-June. to activate a popcorn machine. potential to change his life. The seven-year-old has significant motor and neurological deficits. 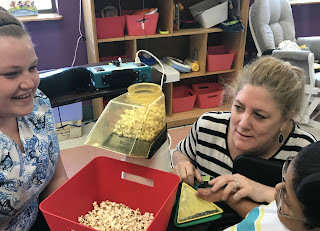 However, over the past year teachers and therapists at the New England Pediatric Care Day School have observed emerging communication skills. Ahmad uses many vocalizations to greet people and to have his needs met by caregivers. The Tobii Dynavox in the trial uses cameras, sensors and algorithms to track eye movement while the user is looking at a computer screen. The implications for communication are big. “If Ahmad demonstrates that he can learn using this technology he will be able to express his needs to caregivers by using the functions of the Tobii to point to pictures on a computer screen,” said Director of Education Amy Gagnon, M.Ed. Ahmad uses Big Mack switches in school. When the Tobii is paired with speech generating devices, individuals can “speak” by activating prerecorded words and messages. The trial will determine whether Ahmad can use the Tobii functionally, meaning whether he can use his ocular muscles consistently so that that the software algorithms can work. If so, the system can be purchased for his personal use. 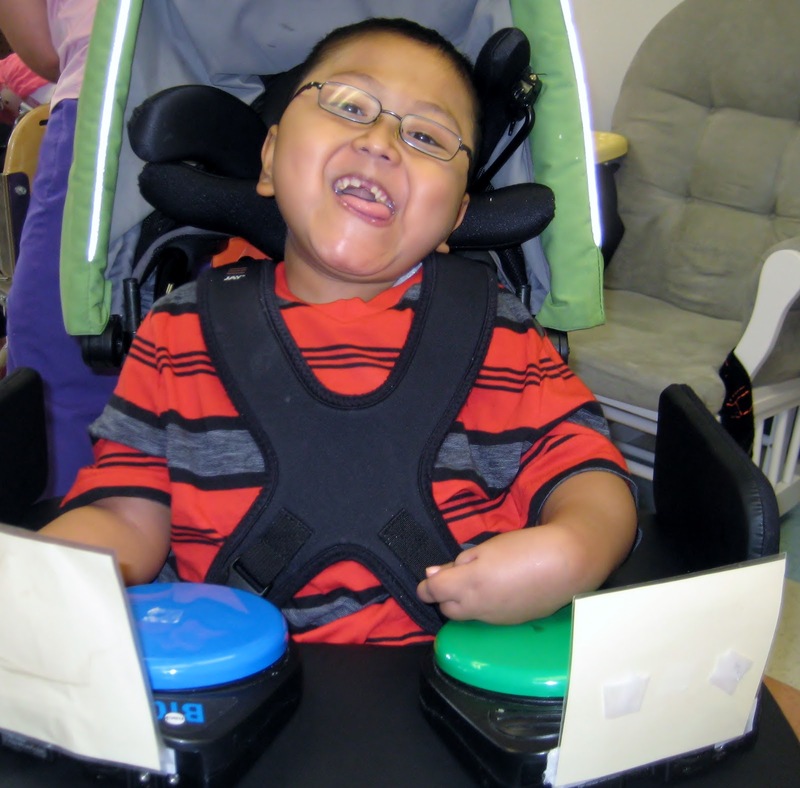 “We have had successful outcomes with Tobii in the past. A second student is in the midst of a similar trial,” Amy noted. For more information about the day school at NEPC, visit www.nepc.org. H.A.L.O. has funded many high and low-tech devices to enhance learning and quality of life for children with complicated neurological impairment. They include communication boards, basic switches, Big Mack switches and iPads. “Our kids are especially drawn to iPads so we use them for learning, motivation and recreation,” says Ellen O’Gorman, Executive Director of New England Pediatric Care, a skilled nursing home and day school for medically-fragile children in Billerica MA. Tech-savvy staffers in the speech therapy department have compiled a list of developmentally appropriate iPad apps (applications). The top pick is the GO Talk app designed for those who have limited or no speech. Teachers also use Super Sound Box and Voice Changer to record and/or change vocalizations so children can hear themselves. Other apps include Pocket Pond, Proloquo2Go, Sounding Board and Fluid Monkey. Ellen notes that using technology creates common ground between parents and siblings with their family member and increases interaction. While many apps are free or 99 cents, the more sophisticated apps designed by speech therapists can cost as much as $499. NEPC actively seeks grants and donations to purchase apps and iPads. Read reviews on apps on these websites: momswithapps.com, iheartthisapp.com, smartappsforkids.com and appstarpicks.com. 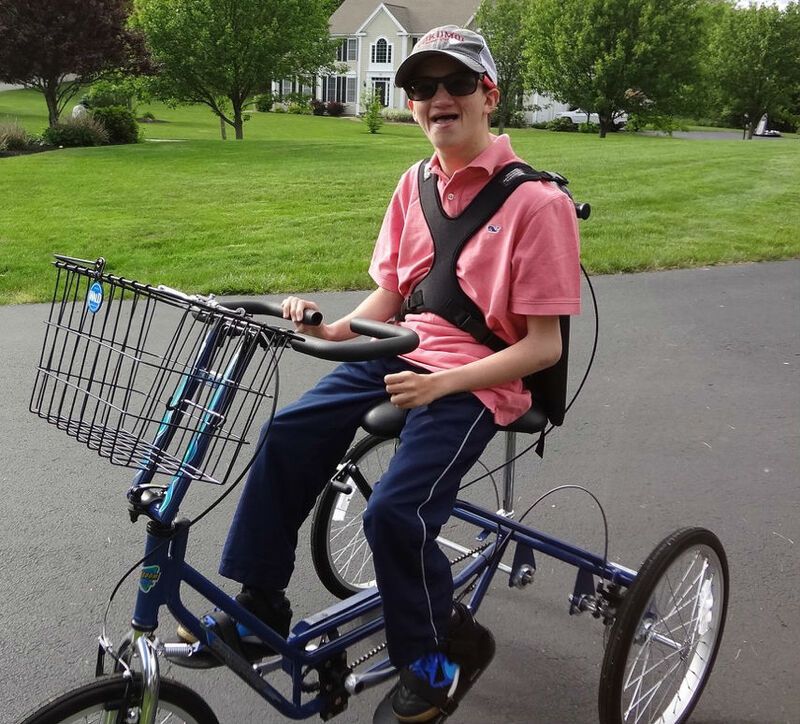 When Owen B. of Massachusetts outgrew his second hand-adaptive tricycle, his family was stunned at the cost of a new adult-sized trike — about $3,500. Without it, the 14-year-old, who has Joubert and Dandy-Walker Syndrome, could not keep up with brother Kyle and his huge gaggle of accepting friends. With H.A.L.O. ‘s help Owen can interact and his trike is the envy of all the kids. Eduardo of Lancaster, California was developing normally until age 10 when he was diagnosed with adrenoleukodystrophy. This degenerative condition destroys myelin sheathing in the brain causing loss of physical and cognitive abilities. 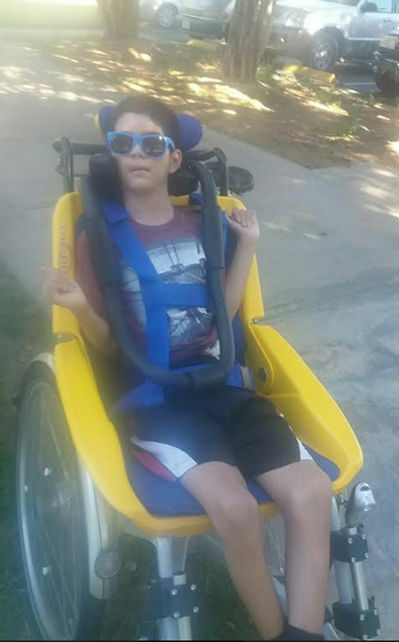 At age 12, Eduardo now requires a wheelchair to leave his home. Hillary Cohen, ACSW, a social worker with Libertana Health Care, discovered H.A.L.O. 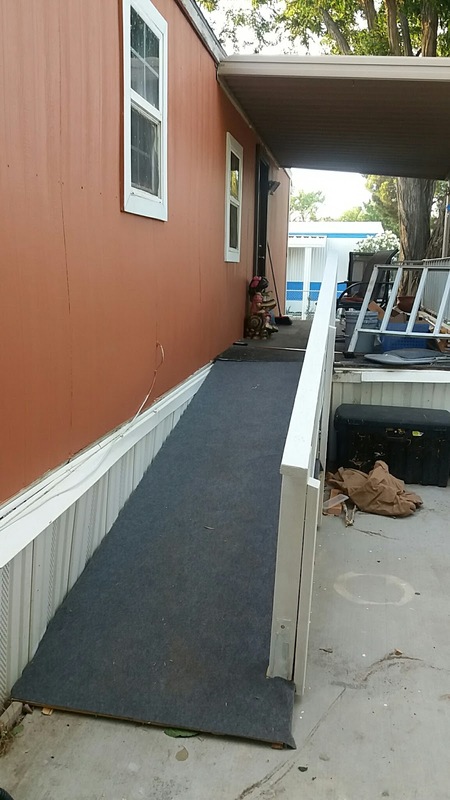 in a Google search, after insurance denied funding for a standard ramp due to the trailer home’s measurements. As a result of HALO's generous funding of building supplies, Eduardo's father, who works in construction, was able to build a custom ramp. “This has been life-changing for Eduardo as it has allowed him to access to community safely,” said Hillary.